Wait…. 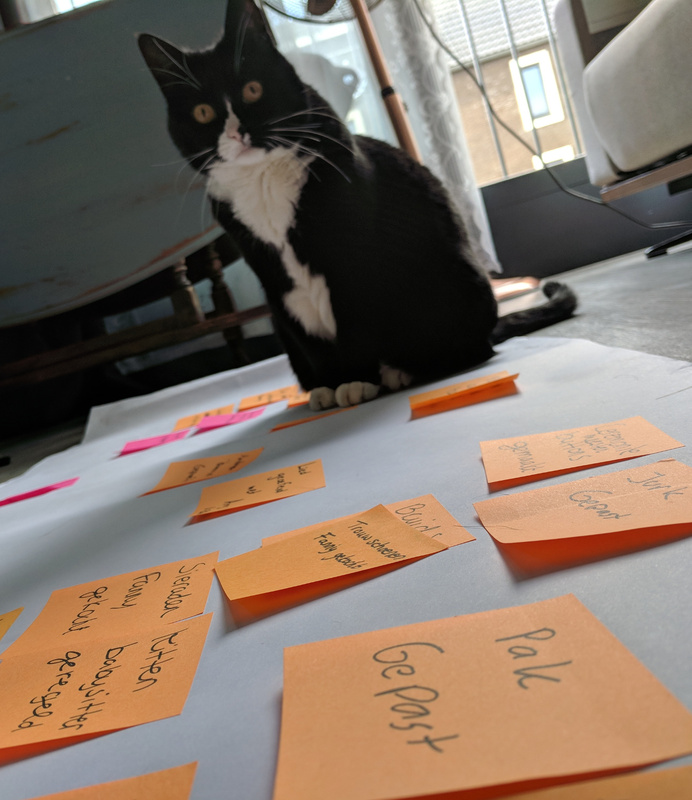 what, EventStorming for planning? Most of us know EventStorming as a tool being used to quickly explore a domain with the business, to start modelling and building software to solve complex problems. But the basis of EventStorming is visual storytelling and can be used on anything that has a timeline. Sprint planning, team flow of developing, and retrospectives are just a few examples. 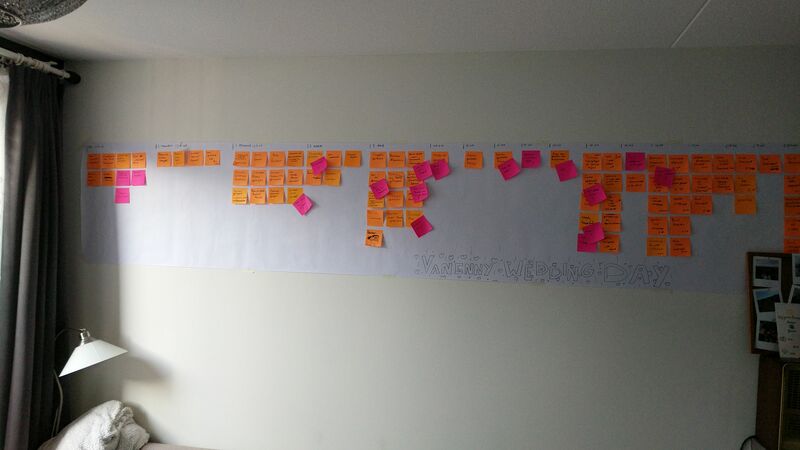 The setup for a (wedding) planning EventStorming is simple, arrange some space to lay out a roll of paper, grab enough coloured stickies, and enough sharpies for writing. Invite the right people; in my case: my soon to be parents-in-law and the masters of ceremonies (my soon to be siblings-in-law). Throw in enough snacks and drinks (because this can get long and messy), and away we go! Start with splitting up the paper in separate zones that represent a period before the wedding. Split them up preferably with some sticky labelling so we can change the size of a zone as we storm. Don’t worry if we don’t have it; writing on the paper can also work, but it can leave us out of space on some time zones. Making the period fixed also has a bonus: if we run out of space in a specific zone, we might be planning too much for that period. Now comes the fun part, ask everyone in the room to write down tasks as events for the wedding (the orange sticky is the standard EventStorming Event colour, but any other colour would also do). Everyone can place their events wherever they think the event should take place. The paper will fill up quite quickly, it will be a total CHAOS, and we probably have a lot of double events, don’t worry, especially about the chaos, we will take care of it in the next part. After the paper is filled up, and everyone has written down the events that were on their mind, it is time to go through the stickies starting from the beginning. See if every sticky is clear to the rest, and see if it is in the correct zone. Now we will see a lot of double events popping up, throw these away if they are indeed the same events. Be careful that they are indeed the same events! There will also be a lot of events written down that we don’t want at our wedding, for us the opening dance. Throwing that event away is making it explicit that we don’t want that. While discussing events we cannot answer and solve all questions; for this, we use another colour (standard EventStorming colour is pink) to mark it as a hotspot. Eventually, we end up exploring, storming and structuring all the combined knowledge for our wedding. We got input from our family, which gave us the opportunity to discuss their wishes. The result is a paper filled with tasks in the form of events for a specific period. Assign these events to specific people by using a small sticky and put it on the event. We now have our planning complete. We can now hang the result up somewhere in our home. Having this made visual will relieve our stress because we now have the feeling that everything concerning the wedding is now made explicit and under control. Of course, we gain new insights, especially while under the shower or waking up in the middle of the night. Just make sure you have stickies lying around to write these down and add it to the brown/white paper. There are tons more work forms you can implement, for instance, you can start doing scrum and create sprints of the time zones. Just do what works best for you. We hanged the result in our living room, and keep adding and removing stickies from it continuous. We also ran an EventStorming for the wedding day itself, creating the basis for a good step by step script for that day.